Foreign Secretary William Hague announced the outcome of a review of UK defence and security export policy in light of events in the Middle East and North Africa. “On 16 March 2011, I told the Foreign Affairs Committee that the Government would review policy and practice with regard to the export of equipment that might be used for internal repression, in particular crowd control goods, in the light of events in the Middle East and North Africa. Government colleagues with responsibilities in this area, in particular the Secretary of State for Business, Innovations and Skills who has responsibility for our export licensing systems and operations, have been consulted in the course of this review. 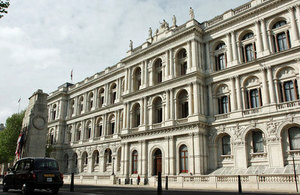 The review concluded that there are no fundamental flaws with the UK export licensing system. But the review identified areas where our system could be further strengthened to enable Ministers to respond rapidly and decisively to the outbreak of conflict, instability or unpredictable events in other countries. Respect for human rights and fundamental freedoms is already a mandatory criterion for all export licence decisions. The changes announced today will increase our confidence that UK origin goods will not be misused for internal repression, and that our controls are being applied in an orderly and systematic way, informed and influenced by our values and interests. This will complement the Government’s efforts to build Britain’s prosperity by increasing exports and helping UK companies succeed in international markets. The Government proposes to introduce a mechanism to allow immediate licensing suspension to countries experiencing a sharp deterioration in security or stability. Applications in the pipeline would be stopped and no further licences issued, pending Ministerial or departmental review. We also propose the introduction of a revised risk categorisation, based on objective indicators and reviewed regularly, that keeps pace with changing circumstances; enhances our assessment against all export control Criteria, including human rights violations; and allows specifically for Ministerial scrutiny of open licences to ensure that the benefits of open licensing can be maintained while keeping the associated risks to acceptable levels. This will increase oversight by Ministers, including of individual licence applications. As a result of these changes the Foreign and Commonwealth Office will ensure that export licensing policy is more responsive to rapidly changing circumstances, particularly political instability; bring more structure and consistency to the gathering of export related information, provide more information on the human rights situation in country, including through following new security and justice assistance guidance and undertake end-use monitoring of controlled military goods, bearing in mind both the practical and resource limitations. The Government will continue to work to improve public information on defence & security exports, including enhanced transparency of routine export licensing decisions and how we respond during a crisis. We welcome the scrutiny of the Committees on Arms Export Controls and will continue to assist in their important work. The Government has also considered how we can strengthen our decision making when we provide security and justice assistance overseas. We must provide assistance to international partners to tackle threats such as terrorism, serious organised crime and conflict prevention. In doing so, we will ensure that this assistance supports our values, is consistent with our domestic and international human rights obligations, and seeks to promote human rights and democracy. To this end, guidance will be issued for all HMG officials on assessing the human rights implications of our overseas security and justice assistance. We will make this guidance public later this year. We are committed to robust and effective national and global controls to help prevent exports that could undermine our own security or core values of human rights and democracy; to protect our security through strategic defence relationships; and to promote our prosperity by allowing British defence and security industries to operate effectively in the global defence market.